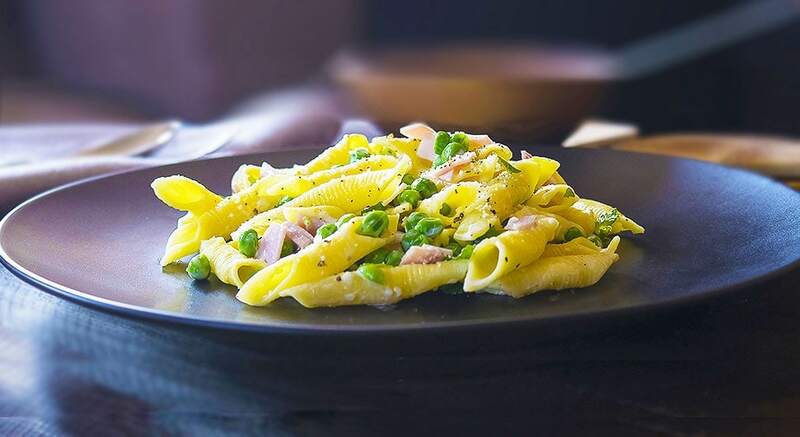 The Italian region of Bologna is the home of fresh and filled pastas. They have the most unique shapes and each pasta shape compliments specific dishes to hold up to the different sauces. Garganelli looks similar to penne but it has a small flap and holds cream sauces perfectly. You can find it at your local Italian market, or make it fresh from scratch using a pasta maker. I was feeling like some comfort food, and realized this traditional recipe is a wonderful new alternative to Mac and Cheese. 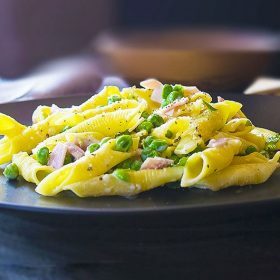 It is rich and creamy and very easy to make…with only a few ingredients, you can have this pasta dish on the table for dinner in only a few minutes. As another alternative, you can cook the pasta very al dente, and then toss it in the sauce, put it all in a baking dish and bake it in the oven to make a delicious pasta al forno. 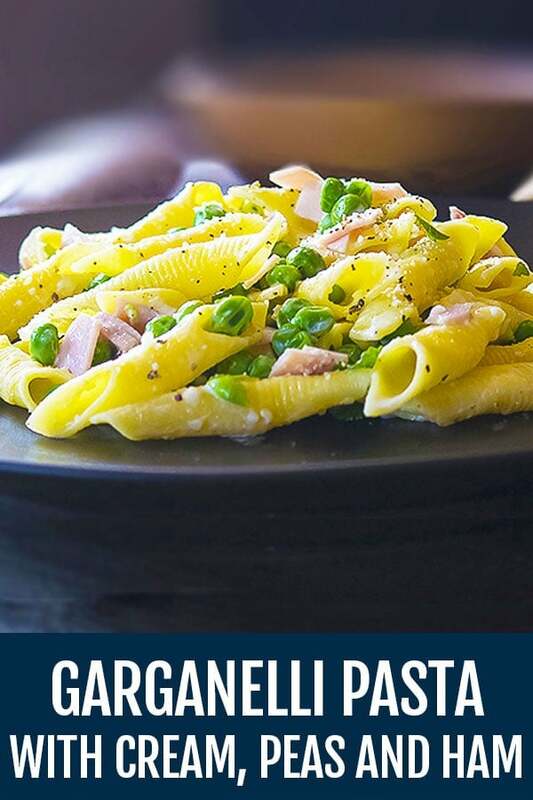 Either way, it is creamy and delicious and will satisfy your craving for a comforting pasta dish. Garganelli pasta is an underrated fresh pasta. Usually eaten with oven baked casseroles, in this recipe we present a delicious variation. In a large 12" skillet add the cream and and cook over medium/high heat until reduced by half, about 5 minutes, turn off the heat, add the Parmigiano-Reggiano and season with salt and pepper. Set aside. Add the pasta and the peas together and cook until pasta is al dente. Drain pasta and peas and reserve 1/2 cup of the pasta water. Add the pasta with the peas to the sauce and cook on medium heat stirring occasionally, until the sauce begins to coat the pasta, about 2 minutes. Fold in the ham and mint. Add some reserved pasta water (if necessary) to loosen the sauce.